Simple, tried and true – it’s an adage heard often in 12 Step fellowships. 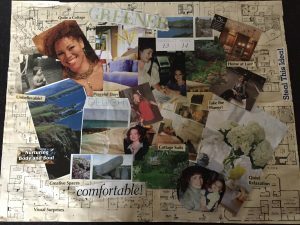 So what is a “Vision Board”? It’s a tool for creating authentic outcomes in our own, ideal life. And yes, they work. 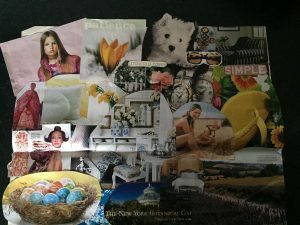 This Huffington Post article got my attention in early 2015: “The Reason Vision Boards Work and How to Make One“. The term “Vision Board” was new to me. Somehow I’d missed the years of evangelising by Oprah, Ellen DeGeneres, and other celebrities – and I was skeptical. Yet, I knew they worked, I’d actually been doing them for years. Twenty five years ago, I discovered the book and 12 week The Artist’s Way program. This was long before ‘vision boards’ existed. There was a “collage” assigned during Week 7, and it opened the door to a career change and more lucrative work; five years later a second collage inspired a major shift personally. 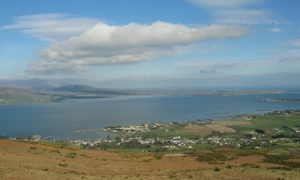 Fifteen years ago, another collage catalysed a move from America to Ireland. Twice yearly now, I usher Artist’s Way groups through the process of making their own – and often, I join them. Updating the images provides an insight into the effectiveness of your efforts. It’s like the infernal voice emanating from a GPS after a wrong turn: “Recalculating“. It’s a call to action. Re-route and get focused on the path of your own choosing. Clarity about and a focus on your destination, keeps the chaos, distractions and busy-ness of life at bay. Doing a collage or a vision board just didn’t seem like work, so I was skeptical. And thankfully it’s not! But occasionally, we need reminding: work isn’t all it’s cracked up to be! Creativity resides in our “Artist Brain”. It’s our inventor, it’s childlike curious and apt to take chances – collecting images, being present to possibilities while silencing the “censor” is what’s unleashed while we’re creating the boards. Images are powerful. This photo was taken by Riley Robinson during a 2005 course we attended in Ireland became my screen saver. Three years later I was living in that very village. Aligning our intention with our values, staying tuned in to the repercussions of our choices, and focus, is what ultimately determines whether we can sustain the changes we “think” we want to make. Let’s get back to that Logical Brain and the Artist Brain. Creating the vision, imagining what is unknown – requires turning off the logical brain and tuning in to the associative and freewheeling nature of our ‘Artist Brain’. Now you have to close the sale. And I advocate doing that with support. To that end, I’ll be delivering a series of Vision Board Workshops. in 2018. They’ll provide a full day immersive experience during which you can achieve clarity in the company of like-minded people. Groups challenge each other. On the day, you’ll find you dig deeper and are supported. Later, should you find your enthusiasm is waning, your peers are there to reflect back the best of what they’ve heard you commit to. A goal is a dream with a deadline- let’s get dreaming! The next workshop is on Saturday, 12. March 2019. Interested in laying a foundation for your best future? Click the link or leave your details to the right.